Taken from an illustration in the 1896 edition of The Royal Natural History. Carved on oak, finished with Tung oil and beeswax polish. 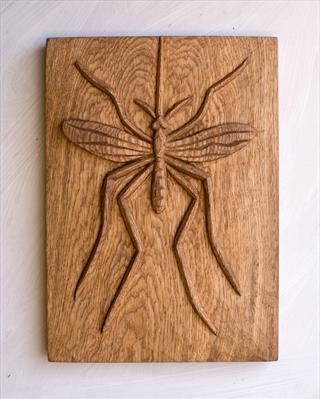 This is the first of a series of small relief carvings of insects. My interest in them began when I was researching visual reference for The Three Post Bench I made for The Gyosei Art Trail on the Grand Union Canal in Milton Keynes, installed July 2016. A very special resource is the 1896 edition of The Royal Natural History which I have inherited from my father and which is illustrated with beautifully observed engravings.